This antique haveli is said to have been built around 225 years ago by the Rawals (title of a princely ruler) of Samode. The foundation for the haveli was laid by Rawal Sheo Singh, the then prime minister in the Jaipur court. The mansion, regal in all ways possible, was converted into a heritage hotel in 1988, and it now houses 39 luxurious rooms, as well as suites, with a multitude of amenities. As a reminder of the aristocratic family’s splendid past, the antique furniture and original artwork has all been kept intact. What makes Samode Haveli an appealing choice for a visit and stay for travellers all across India and the globe, is its central location. This gorgeous residence is in close proximity to the Amber Fort, Jal Mahal, Hawa Mahal, City Palace Museum, and Jaipur’s famed shopping centre. Johari Bazar. Decorated with beautiful lights, props, and posters, this jewellery market is a stunning place to shop at or even just to walk through during Diwali. Akshardham Temple. This place of worship, also known as Mini Vrindavan, truly knows how to attract visitors, thanks to its brilliant display of lights. Nahargarh Fort. Set up on a prime location, the fort offers a stunning view of the glittering golden city, perfect for a photo-op. Chaura Rasta. The street lies within the walled city of Jaipur, surrounded by age-old structures decked up in the finest decorations. It’s a treat to stroll through. An architectural wonder, the Suryagarh Haveli is truly something out of a medieval story. 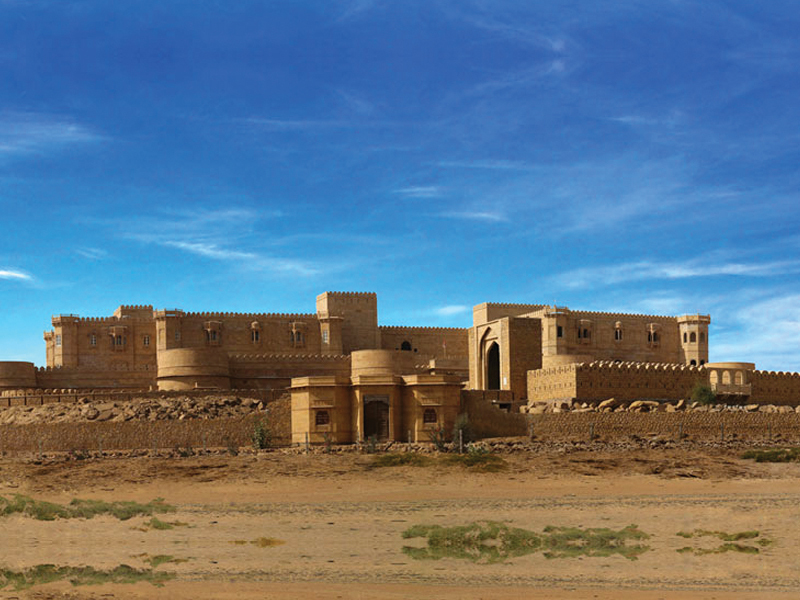 While the desert city itself was founded in 1156 CE by Maharana Jaisal Singh, the haveli came into existence as a tribute to Jaisalmer’s Rajputana heritage. Apart from its sandstone walls, its turrets and ramparts are enough to transport anyone back in time. Meanwhile, the resort hotel’s contemporary facilities are comfortable enough to leave visitors spoilt for choice. Moreover, blending the old with the new in the classiest of manners, patrons can choose between 62 luxurious rooms. 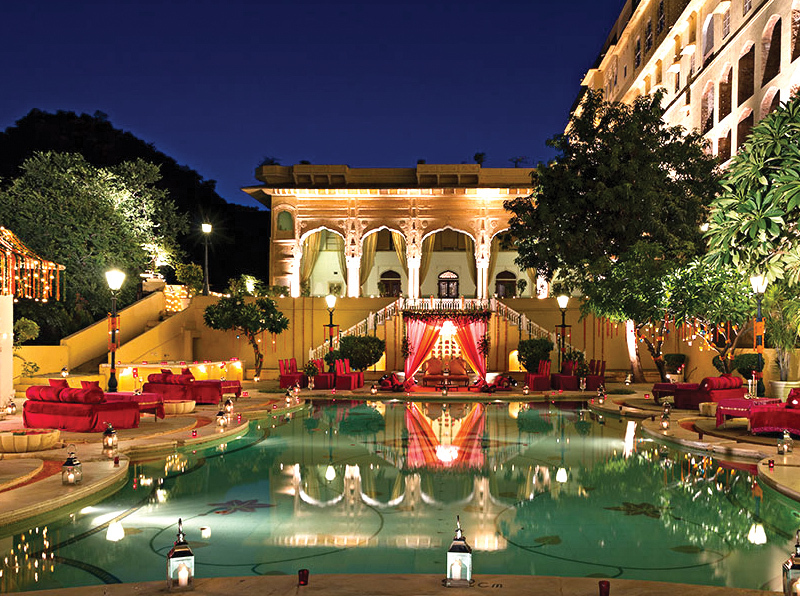 They include Palace and Grand Heritage Rooms, as well as Signature, Luxury, and Jaisalmer Suites. However, the icing on the cake for this royal experience are the range of activities, both adventurous and recreational, organised within the haveli’s towering walls and throughout the city. Sam Sand Dunes. 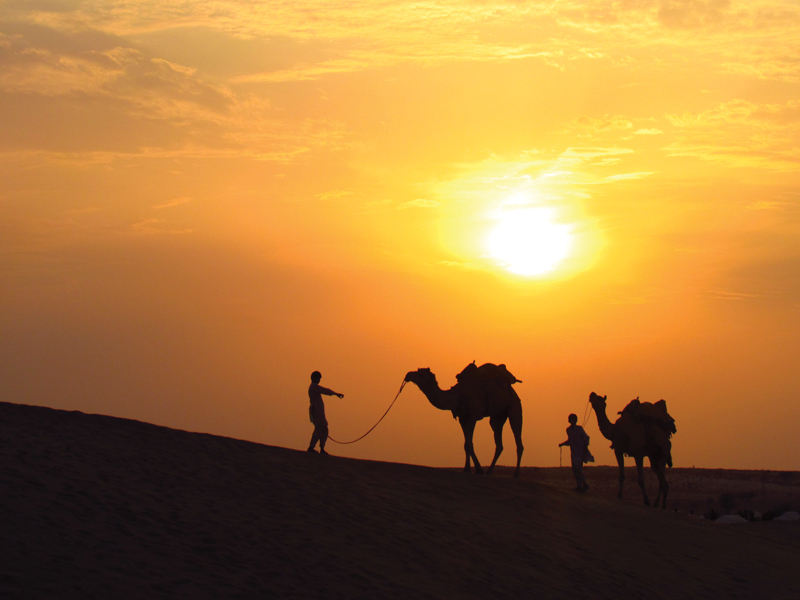 A short drive from the haveli, the scenic beauty of winds rippling in the dunes is a sight no one can afford to miss. Jaisalmer Fort. Surrounded by 99 turrets and located above the Trikuta Hill, one can trace back the origins of the desert city to this golden fort which is more than 800 years old. Desert National Park. A protected sanctuary close to the Suryagarh Haveli, the Desert National Park houses and cares for a range of rare and prime natural attractions. Adventure and Sports Activities. Here you can try mountain biking through desert trails, experiencing the Thar on a camel safari, or participating in the warrior arts of Dhanurvidya. The Umaid Bhawan Palace, earlier known as the Chittar Palace due to its use of stones from the Chittar Hill, began construction in 1928 and was completed in 1943. Named after Maharaja Umaid Singh, the palace is now owned by his grandson, Gaj Singh. Spread across 26 acres, the palace is divided into three parts: the royal family’s residence, a museum on the 20th century history of the Jodhpur Royal Family, and a luxury hotel managed by Taj Hotels. 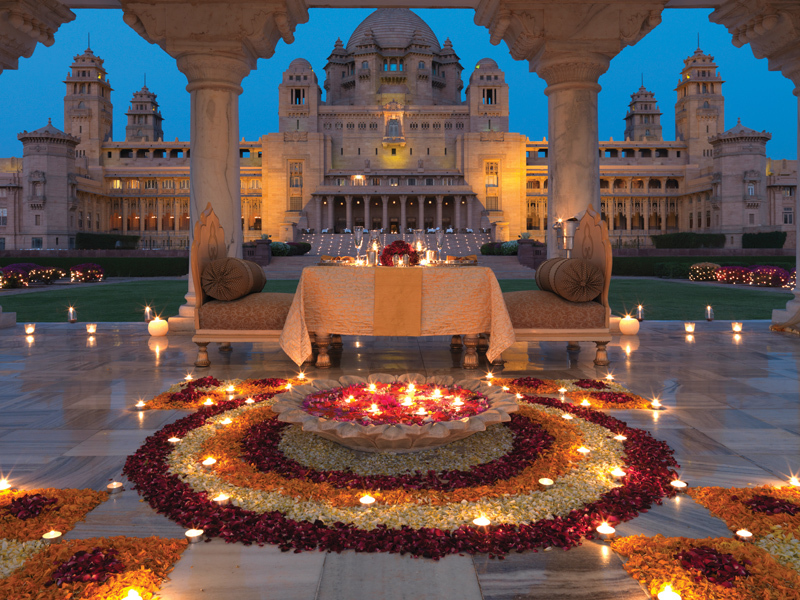 Out of the 347 rooms in the mansion, 64 lavish rooms are set aside for guests at the Taj Umaid Bhawan Palace. The golden sandstone structure brimming with Art Deco style is also situated in a prime location, not too far from (nor too close to) the hustle and bustle of the Blue City. So whether a traveller decides to soak in the culture of the city’s many attractions or enjoy the skilled hospitality of the hotel, they’ll definitely have the best of both worlds. Mehrangarh Fort. The red sandstone fort set atop a hill is a historical goldmine filled with stories of many battles, sensational secrets, and breathtaking views. Rao Jodha Desert Park. Located quite close to the Mehrangarh Fort, the park houses ecologically restored desert and arid land vegetation. It includes and is surrounded by volcanic rock and sandstone formations. Jaswant Thada. The gleaming white marble mausoleum built in memory of the then monarch, Maharaja Jaswant Singh II, is as humbling as it is beautiful. Sardar Market. A gorgeous place that comes alive with its colourful textiles in varied prints, pure leather footwear and interesting artefacts.